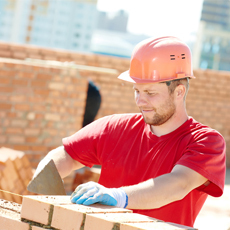 The Scottish Vocational Qualification (SVQ) in Bricklaying (Construction) at SCQF level 5 allows candidates to demonstrate competence in job-related skills in their area of work and expertise. This qualification covers areas such as general workplace health, safety and welfare; productive work practices; and erecting structures. Successful candidates will gain an internationally-recognised qualification which guarantees that they have the skills, knowledge and abilities they need to carry out their role successfully. Employers will also benefit from their employees being proficient. The SVQ Bricklaying (Construction) at SCQF level 5 consists of four mandatory units and three to five optional units.